he used to work. He was the fourth Straw Hat member to join Luffy after Zoro, Nami and Usopp. As revealed recently, he is the third son of the Vinsmoke Family and the first Straw Hat member who wasn’t from East Blue(his origins are from North Blue). 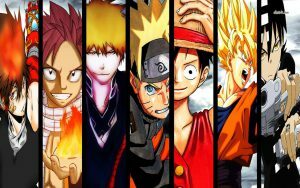 The monster trio as it has been called(the three most powerful Straw Hats) consists of him, Luffy and Zoro. Like all the Straw Hats do, he has a dream to fulfill. He wants to find All Blue, where all the seas meet. There it is supposed that all wildlife of the sea will be present, so it would be a paradise for a chef like him. His bounty is 177 million belly, which will be given only if he is caught alive, per his father’s demand. We all know his love for women and the fact that he even refuses to attack them. 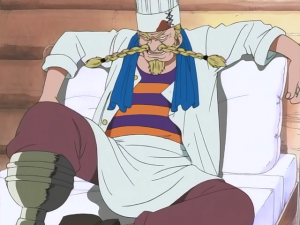 Zeff, the chef of the Baratie was the man who raised him and even sacrificed his own leg, so that Sanji had something to eat. Sanji is also usually calm and composed, almost never acting without thinking first. One interesting fact we can also stress out is that he seems to act on his own and get himself separated from the crew in order to help them. He did it in Alabasta, in Skypiea with Enel and at the Baroque Works arc. He also did that recently in Zou, essentially saving his crew from Capone Bege and his Firetank Pirates by getting himself and Ceasar Clown only captured by the Big Mom pirates. During the two year timeskip he trained with Emporio Ivankov in an island full of okamas. 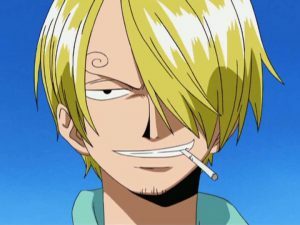 We recently learned that Sanji is the third son of the Vinsmoke Family. But what exactly are they really? 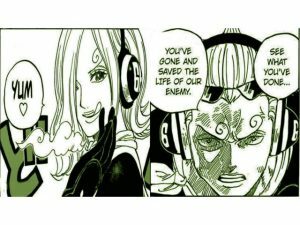 Well, the Vinsmoke Family is a family of Underworld assassins. They now command the paramilitary organisation called Germa 66, an organisation which is supposed to be technologically advanced beyond measure. In the past the Vinsmoke Family using the Germa 66 and their military might conquered and ruled over the entire North Blue. They no longer do, but they have kept their status of royalty up to this day. They are so powerful that they can call a Reverie. For those unfamiliar, a Reverie is a World Council formed by the World Government, with members the world’s biggest leaders of the most notable kingdoms. The patriarch of the family is Sanji’s father. He holds so much influence that he can alter the bounties and even their conditions. We do know that Sanji also has 3 more brothers and a sister. As it is natural, the family’s signature trait are the curly eyebrows. Sanji’s father, being the head of the Vinsmoke family lately made an agrrement with the Charlotte family. Who is the Charlotte family you may ask? 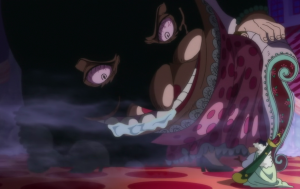 It is the family of a woman you may have heard of, and that woman is called Big Mom. The Yonkou Big Mom that’s right! Her real name is Charlotte Linlin and she has 84(!) children. Hence the nickname Big Mom. The agreement of course was a political alliance between the two families. That way the Germa 66 will also be affiliated with the Yonkou Big Mom. But, the whole deal had to be sealed with a marriage. The marriage between the 35th daughter of the Charlotte family, Purin and the third son of the Vinsmoke family, black foot Sanji! As we know, the Supernova Capone Bege(he seems too old for a rookie doesn’t he?) and his Firetank Pirates are affiliated with Big Mom. That’s the reason why he captured Sanji and Ceasar Clown at Zou. Sanji is needed by the fat woman Yonkou about the marriage with her daughter. By deciding to sacrifice himself for the sake of his crew, Sanji essentially decided to confront his family. I believe that the next chapters will be centered around Sanji and his past(maybe a little Brook too), with the Straw Hats facing the Vinsmoke Family, the Germa 66 and maybe a part of Big Mom’s power(not sure if she will be the main antagonist yet). It has been joked about in the past that Sanji wanted Absalom’s devil fruit of becoming invisible for his pervert needs. But what if Sanji will really obtain that fruit in the future? It could be a possible match for him, if we considered he stems from a family of assassins. What more fitting than an invisibility fruit for an assassin? Also, if Absalom still spies for the World Government, could it be that he is the one who took the real photo of Sanji and led to the Vinsmoke Family learning about him? 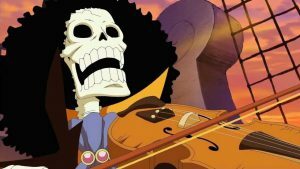 Brook was familiar with the name of the Vinsmoke family when it was mentioned. Of course, this could have to do with his age and to having more experience. On the other hand, could it be that he was connected somehow with the Vinsmoke family? It was also mentioned in the manga that he was the convoy leader of a battle fleet that belonged to a kingdom. What if that kingdom was the one that the Vinsmoke family was ruling? This could also explain why his whole crew was defeated. When his bounty was made known, they recongnised him and wanted to get him out of the picture. After all, he must have known a lot about them. So they sent their agents or Germa 66 to wipe out his crew. The way they were killed, with arrows and such, resembles the way assassins kill. So that’s all we have today about Sanji One Piece. He is related to the Vinsmoke family and his encounter with them seems imminent. Share your ideas in the comments below and don’t forget to check our recommendations page for interesting goodies :). 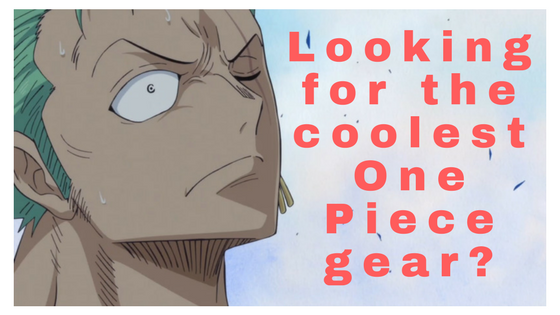 Join the OnePieceTheories free anime newsletter! Thanks, minna and I’ll see you next time! First off I’m a massive fan of all your One Piece theories. I’m not as far in to the episodes as you are. What is your theory on who Sanji will face off against in his family? Something I’m always curious about is who people think would win in a fight out of Sanji and Zorro, I always thought it was implied that Zorro would win but I’m not convinced. Hey Nate, thanks for your kind words. Sanji will face his family basically :P. As to the Zoro Sanji matchup i believe that Zoro is stronger personally, but who knows? It would be a close matchup! Next Next post: The Voice of All Things One Piece – Can someone hear the Poneglyphs?